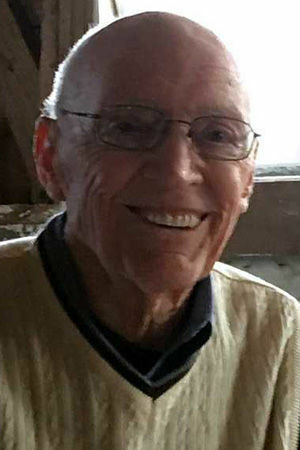 Thomas A. Speciale, 91, of Atlanta, passed away at 1:36 a.m. Tuesday (Oct. 16, 2018) at OSF HealthCare St. Joseph Medical Center, Bloomington. Visitation will be from 5 to 7 p.m. Friday at Quiram-Peasley Funeral Home, Atlanta. His funeral will be at 11 a.m. Saturday at Atlanta Christian Church. Maurice Stribling will officiate. Masonic rites will be accorded following the service. Burial will follow at the Atlanta Cemetery. Military rites will be accorded by Atlanta American Legion Post 341. Thomas Antonino Speciale was born Oct. 4, 1927, in Towanda, the son of Antonino and Elizabeth Miller Speciale. He married Sarah Elizabeth Miller on June 30, 1957, in Armington. She survives. Tom is also survived by their daughters, Sarah Beth (Scott) Peddicord and Suzanne (Chuck) Melchin; one granddaughter, Lydia Peddicord; three sisters, Marguerite Warrick, Betty Meeker and Charlotte (Joe) Gaither; and one brother, Robert (Lucy) Speciale. He was preceded in death by two brothers, Joseph Speciale and William Speciale. Following graduation from Atlanta High School in 1945, Tom worked with his dad laying track for G.M. & O. Railroad. He then served in the U.S. Army. Tom was a member and past commander of Atlanta American Legion Post 341. Tom was also a past master (1964, 1987), treasurer, and 63-year member of Atlanta Masonic Lodge 165 A.F. & A.M. He was also a member of the Valley of Bloomington Scottish Rite, AASR, NMJ, since 1955. He was one of seven founding board members of Atlanta Bowl in 1963, a former Bowling Association secretary, and bowling coach for many years. He was also a member of Order of the Eastern Star, Atlanta Christian Church and Atlanta Fall Festival committee. Tom and Sarah were grand marshals of the Atlanta Fall Festival Parade in 2008. Tom had retired from the U.S. Postal Service after 48 years as a rural mail carrier. Memorials may be made to Atlanta Christian Church Organ Fund or Shriners Hospitals for Children. Final arrangements are entrusted with Quiram-Peasley Funeral Home, Atlanta.